The group that La Insurgencia and Hasel were praising was the First of October Antifascist Resistance Groups (GRAPO). GRAPO, inactive though not formally disbanded, was an armed formation within the Communist Party of Spain (Reconstituted), or PCE(r). Marxist-Leninist (and previously Maoist) in orientation, the PCE(r) is banned by the Spanish State. Seventy of their members have been imprisoned, with many still serving time. From the vaults: The poem and some of the imprisoned PCE(r) members I corresponded with. Along with their letters they would often include stickers, pamphlets, or newspapers. At one point, they included a poem about Palestine that one of their members had written. 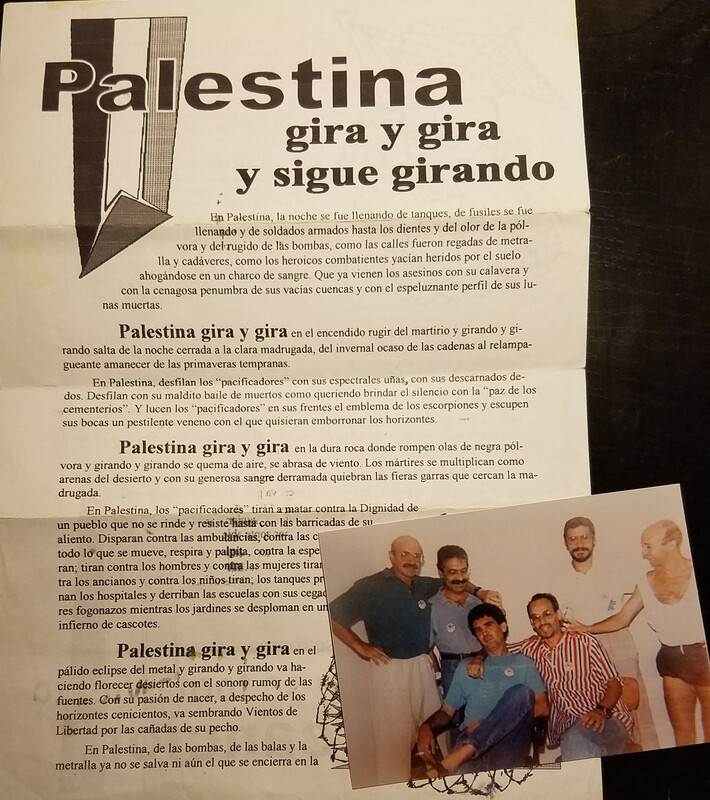 It was the height of the second Intifada and also being involved in Palestine solidarity work, I figured it’d be neat to translate it into English. The internet and translation sites not being what they are today, I remember sitting, flipping through my paperback Spanish-English dictionary, trying to conjure the text and its sentiment into another language. Hampered by my limited skills and the fact that poetry is the most difficult genre to translate, it was quite a failure. Yet as best I can recall, it was my first attempt at translation. At the time, I had no idea where that initial effort would take me, nor that the motivation behind it would remain a consistent force 15 years later. Translating, like many things worth doing, is time-consuming, underappreciated and underpaid. Before I started doing it, my opinion of translators was that they were something akin to glorified copy editors who just swapped one word out and put another in. (Not to demean the work of copy editors, you all are vital to this whole writing thing, too.) Yet as it turns out, it’s a bit more complicated than that – as that first foray made clear to me. In the years that followed, I did not translate much aside from occasional texts directly linked to the organizing work I was involved with at the time. But as my Spanish improved along with my time spent and connections made in Mexico, I became more active around 2008. Since that time, I’ve been involved with various translation collectives and websites and estimate I’ve translated around 200 articles, essays and statements, as well as editing and reviewing about 150 translations done by others. Almost all related in some way to radical theory, organizing, and action in Mexico and other countries in Latin America. The vast majority of translations found a home online, while a handful have appeared in books, textbooks, magazines and pamphlets. To the best of my recollection, I received payment on two occasions for translation work. Like so many others doing translations, I’ve never done it for the money. The bulk of available paid translation work is that which facilitates the flow of capitalism – financial and legal documents, product descriptions and instruction manuals. Material empty of meaning, the only reward to be found in engaging with it is a paycheck, which is less a reward and more of an obligation contrived by the same system that creates all those soulless documents in the first place. I’m not sure how he’d feel about the analogy, but replace poem with translation and you have the essence of social movement translation work. A text that emerges from a site of struggle always contains a component of desperation, for it is that which is intolerable which leads a group or an individual to act. It also communicates to those who want and do not want to listen that there is a refusal and a proposal for something different underway. And of course, it seeks to call attention to a matter that many may be unaware of until encountering the text. To translate such material is to seek to amplify those qualities by making them accessible to an entirely new segment of people. Added into that objective is a sense of responsibility twinned with personal and political affinity. When I began seriously translating, I was living in Oaxaca, Mexico, where numerous struggles were (and are) taking place. What I was translating was a reflection of the world around me, involving comrades, friends and occasionally myself. At times we would sit together and as they worked on the statement, I would follow along, drafting the translation. It felt like a small way to contribute that respected the agency of those involved in the struggle while assisting in communicating important information about the inspiring resistance and severe repression occurring. There was also the realization that such material was unlikely to be translated if I didn’t step up and do it. While it has been some time since I’ve lived in Mexico, I carry those connections and experiences with me and they have guided and motivated subsequent translations from afar. Around the world, most struggles nowadays occur against various manifestations of neoliberal capitalism. As the U.S. is the main progenitor of this world system, it would appear incumbent that those living here are aware of its impacts elsewhere. Few countries have been as drastically impacted in recent years by this phenomenon as Mexico, and the resistance to it there is fierce, as are its consequences. To facilitate the spreading of information about what is happening there to an English-speaking audience creates opportunities for learning, inspiration, movement growth, mutual aid and solidarity. As literary critic George Steiner said, “Without translation, we would be living in provinces bordering on silence.” It is indispensable to break down those provincial borders and work so that no struggle occurs in silence. Translation is an important part of making that happen. Along with the political implications of translating, there is a more profound aspect of it that is revealed through the process itself. Translation is like a jigsaw puzzle where the pieces nearly fit together, but not quite. Nonetheless, it is the task of the translator to manipulate each piece into the appropriate size and shape so that together they interlock and form a comprehensible image approximating the original. Despite the prevalence of machine translation, such technology is insufficient and leads to easily recognizable bad translations. Proper translation depends on in-depth knowledge of the source and target languages – vocabulary, grammar, idioms, slang – as well as the cultural context and implications that the text was written in and is being translated into. By default, this also requires that the translator be a decent writer in their target language. Given the above, a translation is always subjective and never perfect. There cannot be the translation of something, merely a translation of it. “Translation is the art of failure,” Umberto Eco said. As translators, we are benevolent forgers, our work will never capture all the qualities of the original. Yet that does not acquit us of the responsibility inherent in our task. Translators wield a great amount of power as mediators and rewriters of representation. We take the words of another, along with all that is latent within them, and present them in an altered form to new readers. Both that audience and the original author rely on the integrity of our effort – that what is being conveyed in translation is loyal to the contents and intentions of the original. Walter Benjamin wrote, “It is the task of the translator to release in his own language that pure language that is under the spell of another, to liberate the language imprisoned in a work in his re-creation of that work.” Such a labor is no small thing, though easily overlooked or taken for granted. And in today’s world the work of the translator is all the more crucial so that we may communicate, understand, and support one another in the face of the relentless onslaught of those who would rather see us living separately, silently, and in fear. This entry was posted in Reflections, Translations and tagged resistance, translation. Bookmark the permalink. Translating Resistance is fantastic. There’s something to ponder and discuss in each line and paragraph. I love the comparison to Sulaiman’s poem. The essay weaves together so much personal insight, international solidarity, and perhaps most importantly, the essence of working as a professional (2 checks!) radical translator. Really informative, inspiring, and beautifully written. Great article! I especially love the last two paragraphs, I can definitely agree that a translation cannot be perfect, and yet that doesn’t reduce the responsbility of the translator to do his or her best.